Need to get a quote fast and don’t have the time to hassle through voice recorders and call several different companies to see what is the best price you can get? Don’t worry; technology evolves in such a wonderful way that you can now get estimates just a few clicks away with our new auto transport online calculator, without even submitting personal information. However you must be careful, not every online calculator you find online is a legit company, most companies you will find with auto transport online calculators are leads companies and all they do is collect your information to later sell to actual car transport companies and make money of your information. Your information will be distributed to thousands of companies and then you will be bombarded by hundreds of agents trying to get your business. You may even be spammed via e-mail from all the different companies that got your information. Here at AA Car Transport our intention is to make your service faster and convenient, to help you get real and actual prizes after a few clicks and not have you go through the hassle of having several different companies call you all day. 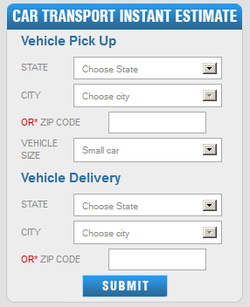 The whole point of our auto transport online calculator is to facilitate your request and give you answers right away. We do not ask for your personal information as these factors do not affect your price; we only ask for what is necessary to calculate your quote: destinations, car model and dates. Go ahead give us a try, your auto transport online quote is just clicks away.